Just in case you have missed the big news : The French reference handbook covering Debian system administration, written by Raphaël Hertzog and Roland Mas, has been translated into English and released as the Debian Administrator’s Handbook. 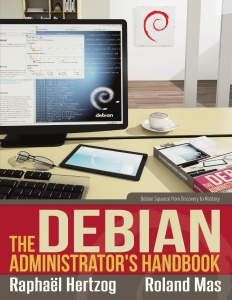 The book teaches the essentials of Debian system administration while trying to be as accessible as possible. The translation of the book was accomplished by the authors themselves, with the help of a successful crowdfunding campaign.